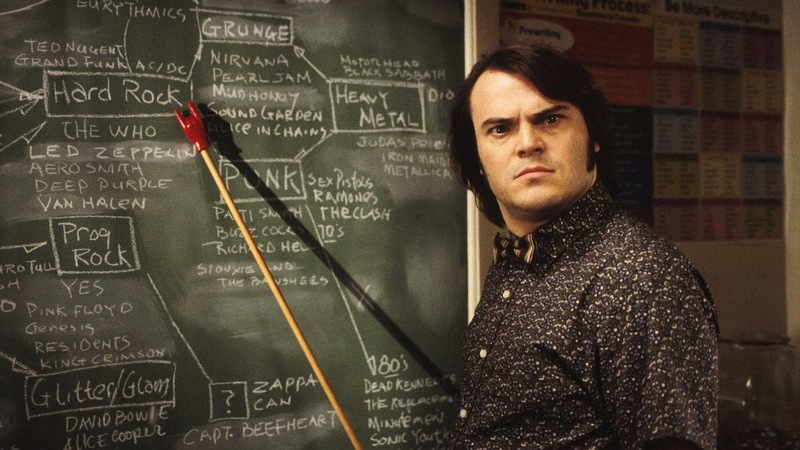 A comedy with plenty of rock music, School Of Rock is about daring to be different. Jack Black shines as an aging rocker who surreptitiously takes over an elementary school classroom and molds the kids into a rock band. Dewey Finn (Black) is a relatively useless rock singer and guitarist, well into adulthood but refusing to give up on his musical dream. Broke and fired from his own garage band, Dewey is at a dead-end in life and fully leaching off his only friend Ned Schneebly (Mike White), a substitute teacher. Ned's girlfriend Patty (Sarah Silverman) wants Dewey out of their apartment for failing to pay rent. Desperate for money, Dewey pretends to be Ned and accepts a temporary teaching assignment at a prestigious private elementary school where Roz Mullins (Joan Cusack) is the principal. Initially Dewey is happy to do nothing and cash a cheque, but when he realizes that the kids have musical talent, he is inspired to try and form a rock band. Maintaining secrecy, Dewey introduces the kids to rock 'n' roll, and soon they are rocking out, revealing hidden talents, learning about life and aiming to participate in a local battle of the bands contest. 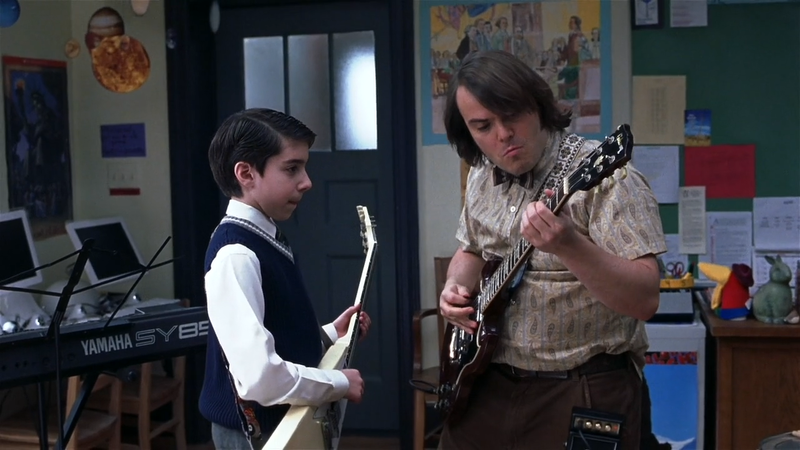 Directed by Richard Linklater and written by White, School Of Rock is a lighthearted and feel-good comedy musical. The film is inherently goofy in a good way, and bounces off the energy of its lead character, with Dewey Finn's refusal to adhere to the rules of growing up fueling his quest to solve the world's problems one riff at a time. Linklater injects plenty of laughs in scenes of Dewey being Dewey, from diving into the crowd and being caught by no one, to sarcastically locking horns with conformists like Patty and Roz. If School Of Rock does suffer from an ailment, it's too much of a good thing, and in particular too much of Jack Black. Good as he is in the role, tip toeing along the enjoyable line of overstatement, there are just too many scenes of Dewey working himself into a frenzy and rocking out the tune of his own legend. While the kids are cute and enjoy individual personalities, the film does not boast much of a fleshed-out secondary cast, and beyond Black there is little talent to admire. So it's either Black or nought, and his overexcited demeanor does get laborious. As Dewey works with the kids and gets to know them, there are hints of interesting sub-plots that would have benefited from more exploration. Guitarist Zack (Joey Gaydos) is suffering under the regime of a strict father; keyboardist Lawrence (Robert Tsai) has no friends, drummer Freddy (Kevin Clark) starts to get seduced by the dark side of the rock 'n' roll life, and singer Tomika (Maryam Hassan) suffers from body image problems. Dewey also never seems to get along with Billy (Brian Falduto), the band stylist. The kids get snippets of scenes hinting at what is going on their personal lives, but none move beyond the sketched-in stage before everyone arrives at the rousing finale. 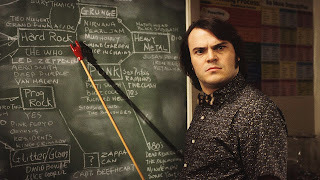 School Of Rock overcomes its shortcomings with an attitude of unabated fun and enough sly commentary to keep both kids and their parents fully engaged. The soundtrack of riff-heavy hard rock and heavy metal classics from the 1970s and 1980s keeps the momentum hopping, and the theme of believing in dreams and pursuing wild passions gets the pragmatic treatment that it deserves: life is less about winning and losing and more about rocking out at the right shows.